In the Baspa Valley, is a quaint little town called Sangla that will win you over, thanks to its immense charm and personality. You’ll fall in love with the light-heartedness of Sangla Valley and that soul of adventure it within itself. Naturally rich, thought-provokingly deep, Sangla Valley lies perched on slopes near the carries banks of Baspa River. One house atop the next, Sangla offers the quintessential Himachali experience. No Kinnaur trip is complete without visiting the two gems of Baspa Valley popularly known as Sangla and Chitkul. It is always best to spend at least couple of days in Sangla Valley and around on your trip to Kinnaur Valley. What is the best time to visit Sangla Valley? Sangla, nestled in the Baspa Valley, is known in the traveling community as the locus of many explorations and trekking trails. With lots of little homestays and camping arrangements near the river, you get to truly experience the love of the Kinnauri clan. Of course, the added bonus of forested slopes in the greater Himalayan range only exemplifies the Pahadi charm of the place. Sangla is situated at a height of 8,900 Ft and is located in the Baspa Valley of Kinnaur district. In fact, the town is so famous, the Baspa valley is often called the Sangla Valley. Blessed with apple orchards, apricots, walnuts, cedar trees, glacial streams with a LOT of trout fish and of course, the fir trees; Sangla is a nature lover’s paradise. Heck, it is bona fide nirvana! Little known fact, Sangla is a Tibetan wood carving center! Thanks to the Sangam of two cultures – Hinduism and Buddhism, Sangla’s inherited zen-like state is fascinating to observe and a good practice to implement in life. Sangla is at a distance of 223 km from Shimla, the state capital of Himachal Pradesh. 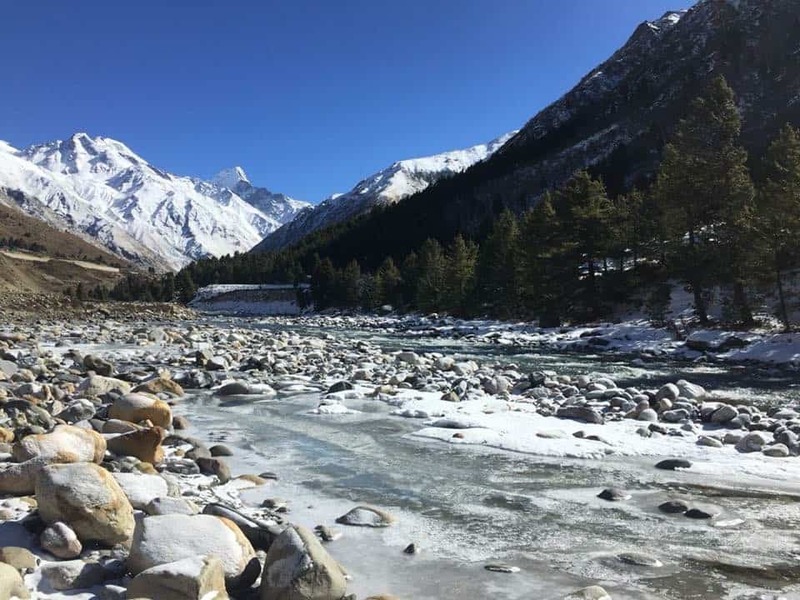 Sangla tends to be the center of Kinnaur valley and often remains the spot that is most commercially explored in the region, thanks to its location and connectivity. Tourists club Chitkul trip with Sangla to cover this part of Kinnaur sightseeing. The distance from Delhi to Sangla Valley is 563 km and people cover the road trip from Delhi to Kinnaur in 2 days to reach Sangla. Kinnaur Valley is a delight for cool-calm-collected weather! Perennially cool, summer months offer the pleasant calm to escape the scorching summer Indian-Heat. 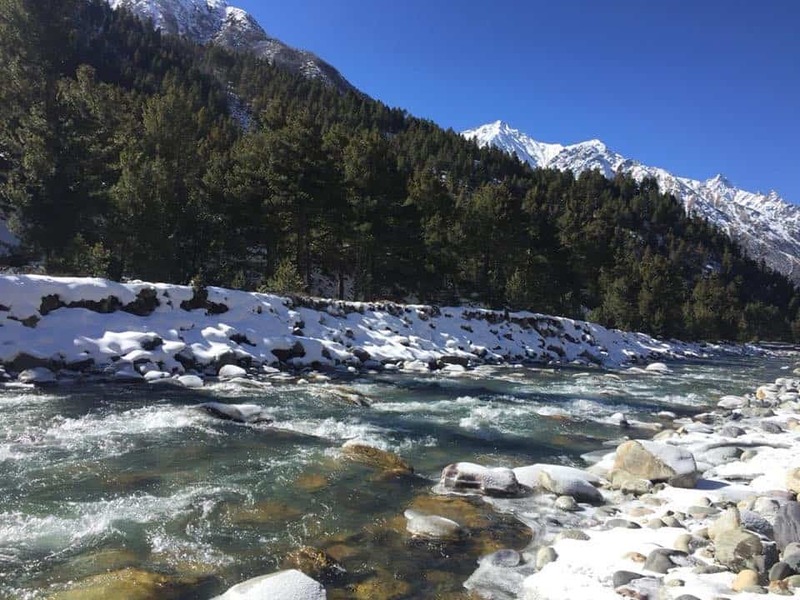 While in the months of winter in Kinnaur Valley, Sangla witnesses the beauty of exceptional snowfall and heart-warming scenery of snow-capped mountains! Winter months in Kinnaur see tonnes of snowfall and Sangla temperature in the negative is a common phenomenon. Expect anywhere from -05 oC to -15 oC on a winter trip to Sangla Valley. Summer is usually cool and the temperatures usually average between 10-25oC. In North India, middle of July till August are monsoon months and it can rain anytime, from mild showers to intense rainfall. 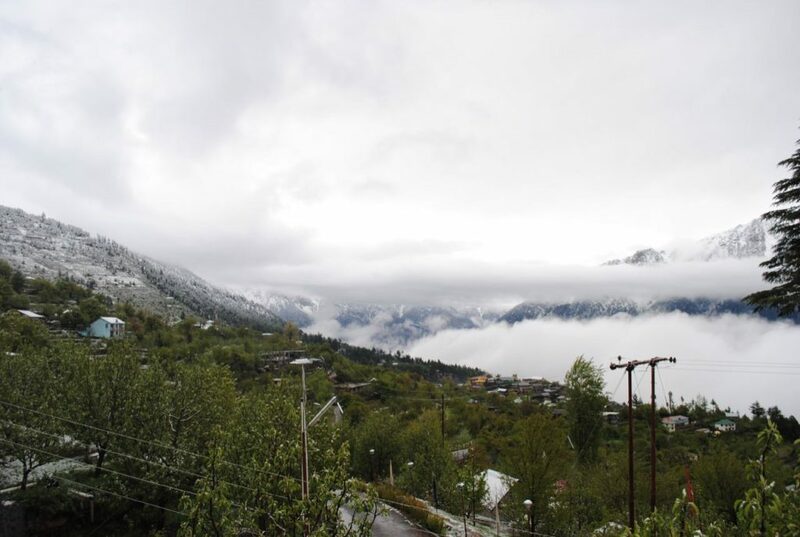 Kinnaur Valley is not the place where you would like to visit in monsoon. 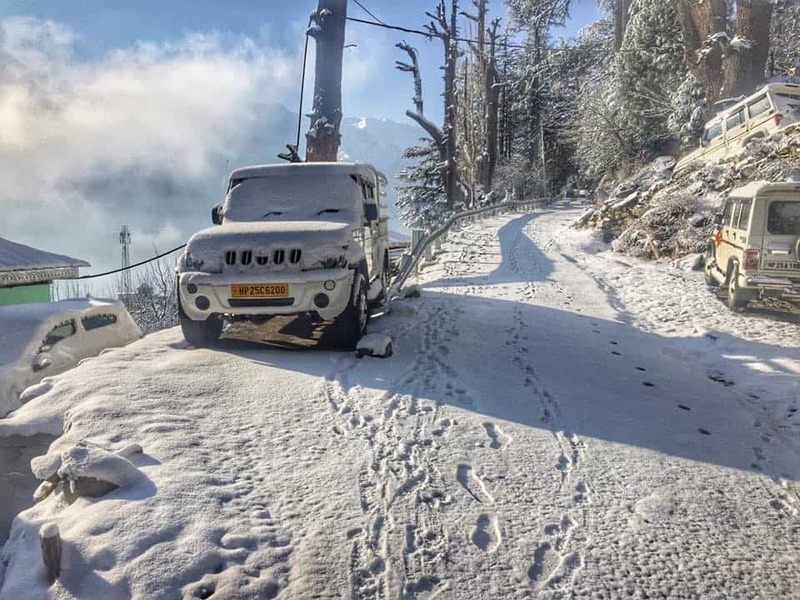 As the heat starts to rise in plains, it is the month of March when most tourists start to plan their road trip from Delhi to Kinnaur. Sangla Valley weather is cool in March with the road to Chitkul just opened in March only. Sangla Valley and rest of Kinnaur gets flocked by many tourists and travelers as the spring and summer months approach. April to June / July, tourism in Sangla Valley is at its peak. After the middle of July and rain starts to bother the region and the road trip to Kinnaur Valley becomes a bit problematic. 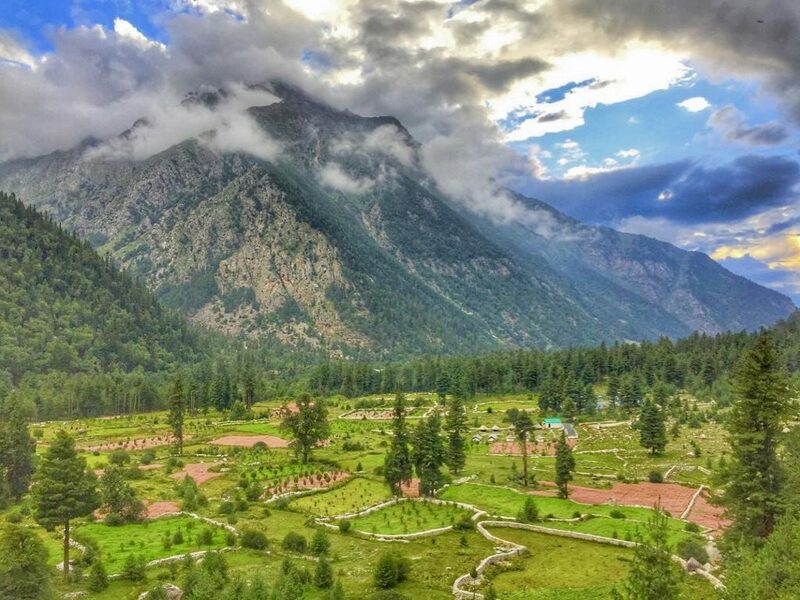 Monsoon season, while pretty, tend to be very tricky for the tourism industry in Kinnaur Valley and Sangla region given the frequent fright of landslides that the fragile hilly terrain is accustomed to. The whole region is of Kinnaur is pretty fragile for landslides and in August, it is pretty common to experience these landslides and road-blocks. One of the best time to visit Sangla are the months of September and October. Apple season is going on and you can pluck the Kinnauri apples from the trees to taste their delicious flavor. Rains go away in Northern parts of India and Sangla Valley road conditions are in much stable / better shape. The roads in entire Kinnaur Valley and up towards Spiti Valley are mostly dry and devoid of any slush. Weather in Sangla becomes quite pleasant and favorable as well in September and October. As the end of October and November comes, the winter chill starts to set in especially in morning and evening in Sangla. The hotels and guest houses start to pack up as well. 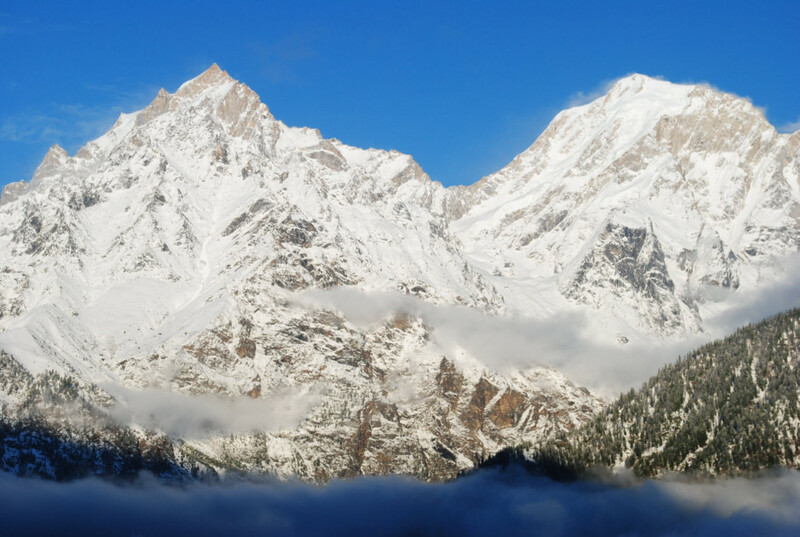 December to February period is said to be the winter months in Kinnaur Valley. In Sangla, temperature touches -15 to -20 degree Celsius. You should also note that the roads to Sangla may close with the heavy snowfall for a few days anytime after the middle of December. But, the authorities do their best to open the road from Karcham to Sangla at least. The road to Chitkul / Rakcham closes down and no effort is made to open it. 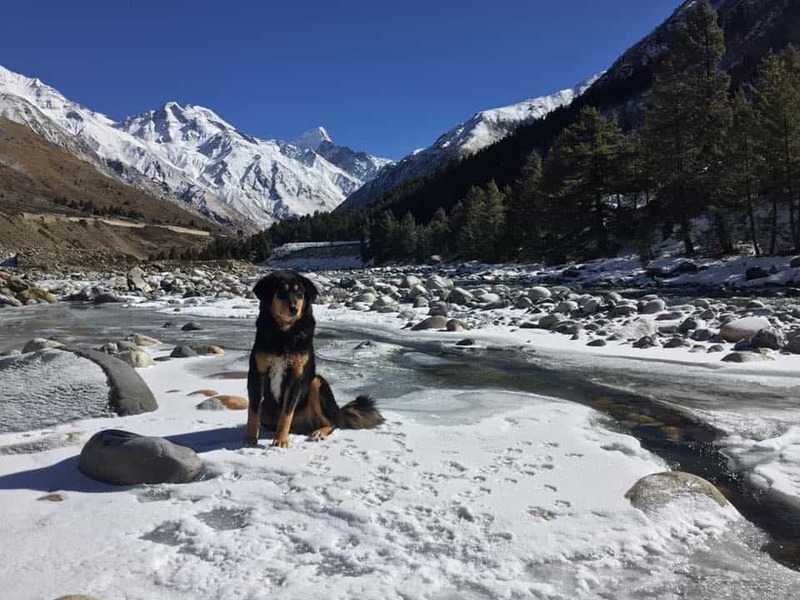 So, it is very important to plan your Sangla winter trip with a couple of buffer days in hand. Whatever toots your horn is a doable thing, when in Sangla. Is it the escapism phenomenon that rocks your boat? Do you want to be snuggled up and enjoy the Garam Chai Ki Pyaali (hot cuppa tea) while it snows outside? Are you looking for a thrilling adventure while enjoying the lushness of forested mountains? Do full-bloom apple orchards spike your interest? Well, worry not y’all – Sangla has you covered. This little settlement in the midst of Kinnaur Valley, perched on the banks of Baspa River will provide you with your heart’s desire. 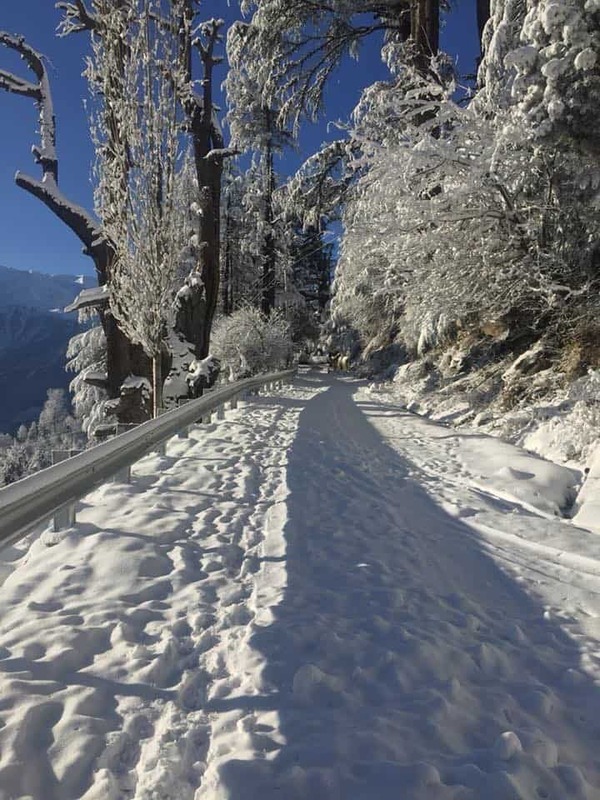 The roads are mostly well connected throughout the year with the Kinnaur valley and you’ll be happy to get into the heart of the hills to enjoy Sangla weathe. Choose your pickings for what you’d like to experience in order to answer the best time to visit Sangla and Kinnaur. August/ September is harvest season for the apples and makes for a sight to never be forgotten, with the entire vistas turning into colors of fertility of the land. In September, the thrilling roads of Hindustan Tibet Highway leading up to Sangla and the clear blue skies make for the perfect adventure, with enough safety mixed in. Sangla can be covered by two ways, either via Shimla or Manali. Usually, folks tend to have a pit stop in the Kinnaur Valley while on the Spiti route. I prefer the route via Shimla for better connectivity and ease, while also packing a punch in terms of beauty. As with this fairly commercial route, the distance from Chandigarh to reach Sangla is 330 km and can take a similar amount of time as it would take you to reach Sangla from Manali. The route takes you through the crests of the hills up till Narkanda. You can take a slight detour and even cover Thanedar on your recommended overnight stay. Enjoy the luscious apples of Thanedar – the true epicenter of evolution for the Himachali apple love-affair! 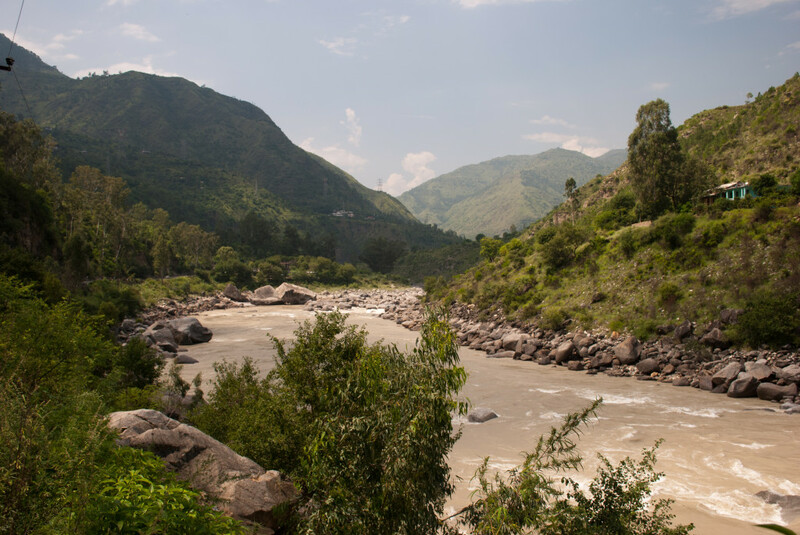 After you cross Narkanda, you’ll descend towards Sutlej river and drive by the banks of the river for the most part till you enter the Baspa Valley, at Karcham. Once you cross Karcham, you’ll be eager and hard-pressed to control your emotions, as the views will have you mesmerized! Also, a pit-stop-must is a makeshift dhaba of sorts right after Sarahan where an old lady serves lip-smacking Rajma Chawal. Yes, the hygiene is slightly questionable, but it is a dhaba after-all! The taste is unbeatable. Rs 50 for an unlimited plate of Rajma Chawal – sign me up! Apart from that Annapurna dhabha near Jeori is the pretty famous for Rajma Chawal too. You’ll reach Tapri, where you’ll spot a petrol pump. Now, this is a fairly reliable petrol pump. The one ahead might or might not have fuel. Fill up! The 18 KM stretch from Karcham to Sangla is a mix of the good, the bad and the ugly. The drive will be mostly average, but the views will make up for this. An ideal stop point on this route is Sarahan. Sarahan has a beautiful Bhimakali temple with gorgeous architecture and splendid views. 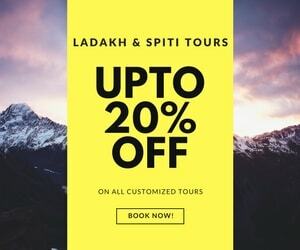 You can travel to Sangla from Manali either from Jalori Pass route or go all the way to Spiti Valley and come down via Nako – Kalpa – Sangla route. While the route to Sangla from Manali via Spiti Valley is about 440 km long, the route from Manali to Jalori Pass to Sangla is 310 km. An overnight stay at Shoja is recommended for traveling from Manali to Sangla Valley via Jalori Pass. You will be crossing the Shoja – Jalori Pass for reaching Rampur. The route then combines with the Shimla route, taking you through to Jeori (Sarahan diversion point) and onwards to Sangla. Nearest Airport is Shimla (223 km). Bhuntar Airport near Manali is approximately 244 km from Sangla Valley. However, due to their small size, these airports have limited capacity and connectivity. Chandigarh Airport lies approximately 333 km from Sangla. Hence, Chandigarh is the best place to start the journey to Sangla Valley if you are flying from any other part of India than Delhi or other Northern states. Again, Shimla is the nearest railway station to Sangla Valley. However, this would also have limited connectivity. My suggestion would be to have your endpoint of the railway journey as Chandigarh, which is well connected throughout. 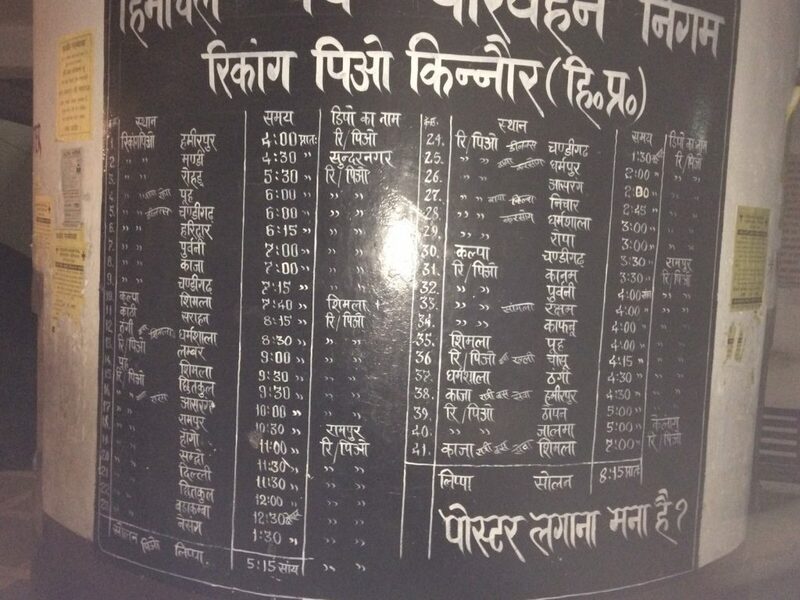 There is an AC bus from Chandigarh, which reaches Shimla around 11 AM and then further connects to Reckong Peo. You’ll need to disembark at Karchamm (one stop prior to Reckong Peo) on the Hindustan Tibet Highway. You’ll be able to get connecting buses from Karcham to Sangla. Also, there are two non-AC buses from Shimla till Reckong Peo. From there, you can connect to Sangla, as described above. Online ticket booking facility is also available on HRTC. There are also some private buses connecting to these regions – this can be checked at the Shimla Bus Stand. There isn’t any direct Chandigarh to Sangla bus service but as you can see you can get the direct bus to Reckong Peo / Karcham from Shimla or Chandigarh and then travel to Sangla Valley easily. Both taxis and private vehicles are easily available here. Of course, I am a big fan of Zoomcar, having extensively traveled with them. This is not an advertisement, but, I can vouch for the ease and comfort of these cars and love to share hacks with my fellow travellers. Reaching Sangla will be a never-forget journey. The thrilling adventure is unmatchable, thanks to the high escalation on the mountains in crossing different valleys of the Kinnaur region. The lush green of the forested mountains complemented by the cobalt blue of the skies almost makes one forget the insanely difficult roads. There is a reason they are called the most treacherous roads in the world. Personally, the trip on Manali Leh highway seemed easier in comparison to the trip to Sangla and further to Spiti Valley! This is primarily due to the fact that on the Manali-Leh road trip, you’re usually driving close to the river bed unless you’re ascending for some massive mountain pass. In comparison, for the Kinnaur Trip, the roads are carved at higher points of the hills, always more enthralling. What are your opinions on this? Which is the more difficult drive – Kinnaur – Spiti or Manali Leh Highway ?? Comment below! Taxis to Sangla Valley are available from Shimla to reach any destination in Himachal Pradesh. You can always get connected with local taxi drivers in this list of taxi drivers in Kinnaur and Spiti Valley. However, this might be an expensive affair. The costing may be anywhere around INR 20,000 depending on the number of days of the trip (as of 2019). In general, these local drivers charge from Rs 3000-3500 per day. To travel around the Sangla village and to explore nearby villages (described below), I would strongly suggest having a vehicle at your disposal. Exploring the quaint town is best down on foot and matching your pace with that of nature! Bering Nag Temple in Sangla Valley is a syncretism of the Hindu & Buddhist religions. Personally, I love visiting places that makes you look at the world in a more delightful light – showing that humanity can truly live peacefully, no matter what differences we might have in our rationale. This blending of cultures and amalgamation of respect is something I truly enjoy experiencing. Add to that the amazing architecture and wooden carvings in the temple compound, and the Nag temple becomes even more alluring. From a mythological standpoint, this temple is dedicated to Lord Jagas (Shivji). It can be reached by trekking for a few km. Fulaich Fair is an annual event in Sangla, which happens in the month of August & September. This festival is famous for the celebration of flowers. While the festival starts with animal sacrifices, – it proceeds to wine drinking and serving traditional food to the needy, while also collecting flowers from nearby valleys to honor the departed. Of course, as is tradition, the festival is celebrated with traditional dances and songs of the region. Angling in Baspa river is another amazing activity, not often on the radar of many tourists. Baspa river has some amazing Trout fish. The crystal clear water of the glacial river makes it easy for novice fishermen to catch some beautiful fish! Word of caution – be as quiet and patient as possible. Saffron Farms in Sangla is a must visit for a visual delight! Thanks to the beautiful climate, the saffron of the region is especially potent. The beautiful views lying a km away from the main settlement of Sangla is a must visit for a unique experience of bursting colors! Sangla Kanda, also known as Sangla Meadows, has stunning views of the snow-clad surrounding mountains. The lush green of the picturesque meadows is a sight to never forget. The gleaming Kinner Kailash in the background will only exemplify the unbelievable experience. The place is beautifully covered with apple orchards and green gardens. While reachable by vehicles – the trek is an amazing experience in itself. It is an easy trek and can take 4-5 hours, given your choice of pace, while passing through Rukti Stream to reach a small lake atop. Rakchham glacial trek – A fairly easy trek, providing the calmest views, taking you across the glacial streams. This trek will provide you with an easy connect with nature. There are couple of worth visiting places in Sangla Valley apart from Chitkul trip. with impeccable cleanness, beautiful orchards, and amazing forests, Batseri is a quaint little village only 8 km from Sangla. With many hidden spots to explore, often leaving the visitor with a feeling that they’re the first person to visit that particular spot ever – the unscathed nature of the landscape of this intrinsic village is enigmatic. Located on the left bank of Baspa, the village can only be reached by foot. The path leading up to the village is surrounded by deodar and palm trees. You’ll be crossing a natural bridge of cantilevered logs to reach the place! With pebbled walls and beautifully carved wooden doors, the village beckons you to explore the idyllic life. Batseri also has a flower festival in the month of September, Ukhayang. The festival offers rare Brahmakamal flowers to the deity in the temple. Kamru is the ancient capital of Bashahr principate. The settlement has become especially known for its beautiful tower-like fort, which is said to be a few thousand years old. It is believed, that there are 36 crores deities inside the compound and lies on the foot of Kinner Kailash. All north Indian food is easily available in all cottages and camps as well as the roadside dhabas in Sangal and around. Also, you must experience the authentic Tibetan Dishes including Thupka, Noodles & Momos along with the spicy red chutney, made purely of crushed red chilies to truly pack a punch. Shopping in Kinnaur region is synonymous with Kinnauri Shawls, & the green and grey Himachali Caps –the symbol of Kinnaur! Another must-buy when in Sangla is Chillu, which is wild apricot oil, thought to have healing powers. Thus, it is used for a lot of purposes, from cooking to applying on dry skin. Having used it myself, I will plan another bottle to be purchased the next time I am in that neck of the woods. Of course, when in Kinnaur you MUST also devour upon apples. Sangla Valley also is famous for its almonds, chilgoza, Ogla, and apricots as well as grapes. Good luck keeping your purse strings closed. Sangla is a paradise for places to stay. There are quite a few well known Sangla Valley hotels & Guesthouses in the region. You can even stumble across many homestays as well. However, if you’re into making plans and bookings you can refer the list. In terms of decent hotels in Sangla Valley – Hotel Apple Pie, Sangla is a beautiful property with a moderate budget but worth the money spent. Run by the humble and hospitable Aman Ahuja whom you can contact at +919857985700,+919999934003. Shruti Guest House is a small, affordable place which is clean and hygienic – but what truly makes this place special is the insane views of the surrounding mammoth mountains! Lakeview resort is another budget hotel that might be a great option for travelers in groups looking for cheaper options. But, I suggest you try camping to get the true feel of the place. There are some amazing camps set up. I have stayed at some of these camps – which had both cottages and tents, set up near the river bed with lots of places to explore. I loved the experience and it was an especially cozy place to be. Also, other camps include Kinner, Igloo Nature, Baikunth Adventure, Sangla Valley Camps with all having cottages and camps available for rent. There are a few camping spots near the village or along Baspa river and near Rakcham. You can easily spot some locals to help you out! So, do not hesitate to take your camping gear and spend a night under a billion-star sky. Many people visit Sangla Valley, Chitkul and Kalpa as a part of their Kinnaur Kalpa – Kaza tour. But, I highly recommend planning a dedicated trip to Sangla Valley and rest of Kinnaur. You should spare a minimum of five days and about 7-8 days for a leisure Kinnaur valley road trip. After visiting Sangla Valley and Chitkul, you should travel to Kalpa and spend some time up there before returning home. I strongly advise staying for a minimum of 2-3 days in Sangla – this tranquil village of Kinnaur Valley. However, a lot of travelers of the region tend to take a day-trip from Kalpa to Sangla – Chitkul. After that they head back to Kalpa or home. Of course, this is primarily due to the availability of more hotels along Sangla, Kalpa, and Rakcham with more connectivity. It is better to spend a night in Sangla Valley first because it helps in the acclimatization. Also, sleeping directly at the altitude of Chitkul may result in AMS issues. ATM – Easily available, Reckong Peo being the headquarters of the Kinnaur District is just 42 km away. Petrol Pump – If venturing from Shimla, one petrol pump available at Tapri and then at Reckong Peo. However, in between, there are plenty of petrol pumps from Shimla to Kinnaur region. If traveling from Manali – Spiti Valley route, then one is available at Manali and then Kaza. So, do not miss the Kaza petrol pump. Medical Help: A few dispensaries are there in Sangla, however, a well-equipped hospital is situated in Reckong Peo, 42 km away. Mobile Connectivity: Good phone connectivity, no matter what network you’re on. In terms of internet, you’ll easily receive 3G/4G signals throughout the town and Reckong Peo. Clothes to Carry: No matter the time of the year, Sangla is always cool, pleasant or chilly. It is advisable to carry warm clothes. And, depending on the activities you take on, it would make sense to also have waterproof shoes or hiking boots or gloves etc. Especially if you’re planning on trekking the Kinner Kailash range then do ensure that you carry enough necessities. Preferred Vehicles: Higher ground clearance vehicles are not necessary for making a Sangla tour. It completely depends on your driving skills and how well you can maneuver the mountains! With the perfectly painted landscape that will make you skip a heartbeat on every angle, Sangla is a delight that gives you the perfect seclusion. If I were to describe Sangla using a metaphor, I would say it is the perfect sunny day, when you curl up on a comfy chair and read a good book and you’re so engrossed in the book where you’d forget that the world around you exists. Sangla Valley is a utopia, waiting to be beckoned and explored. It is a cherished memory for me, and once you travel upon those roads and paths, it will keep us fellow travelers the sharer of the same place! 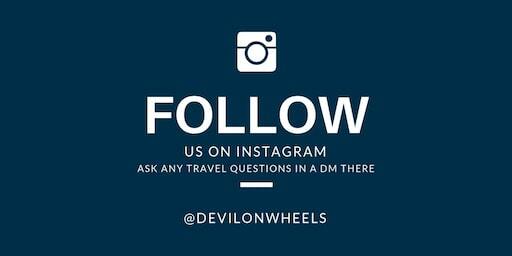 Please feel free to post any queries or doubts you might have in planning your trip to Sangla Valley in the comments section below. If you have been to Sangla, I would love to hear your thoughts and any other information you might feel will be worth sharing with other fellow travelers and prove helpful to them as comments. If you know your friends or family are planning a trip to Sangla or Kinnaur Valley, do share this article with them to help them make a memorable trip to this part of Himachal Pradesh. Hello sir.. Me and my wife with a one year old kid going to kinnaur..chitkul and sangla for 4 to 5 days.in mid march. Is it ok to go with a year old kid regarding the weather, altitude and road conditions..